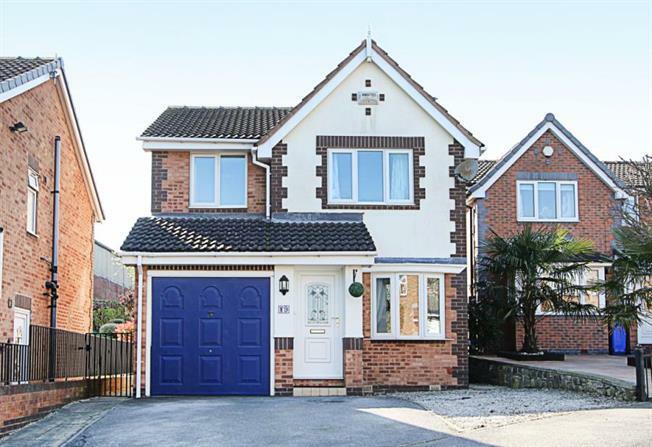 3 Bedroom Detached House For Sale in Sheffield for Guide Price £215,000. This beautifully presented three bedroomed detached family home boasts attractive open plan family room/kitchen/conservatory, as well as having an attractively presented child/pet friendly rear garden. A utility room provides great space for those muddy boots and washing facilities and a master bedroom has the advantage of an en suite facility. A double driveway provides off road parking with access to storage space and the property occupies an enviable cul-de-sac position on this popular & convenient residential development which enjoys the facilities of local shops, schools, public transport & easy access to the city centre, motorway network, Crystal Peaks Shopping Centre & Drake House Retail Park. The property benefits from uPVC double glazing and gas central heating with a recently replaced boiler. Only upon internal inspection can this superb home be fully appreciated. The accommodation in brief comprises: entrance porch, front facing lounge with laminate to the floor, built in shelving and concealed lighting. Inner side entrance hallway has stairs rising to the first floor landing, laminate to the floor, designer radiator, a door leads to the well-proportioned utility room with a courtesy door providing access to storage (previously the garage). There is a downstairs toilet leading off the hallway. The kitchen has a range of wall and base units, electric cooker point, as well as being open plan through to the family room, then into the conservatory overlooking and accessing the rear garden, also having laminate to the floor. First floor landing: master bedroom having built in mirrored wardrobes to one wall and a door provides access to an en suite shower room, double bedroom two also having built in mirrored wardrobes, bedroom three and family bathroom having a three piece suite in white comprising: wash hand basin, low flush wc and bath with mixer tap shower attachment, tiling to splash backs, tiling to floor and extractor fan. Externally: To the front of the property is a double driveway, a side pathway leads to the rear enclosed attractive garden, being tiered, lawned and stocked with a selection of fruit trees, summer house with power and lighting and enclosed child friendly play area. Location: Hackenthorpe is a popular area known for its excellent local amenities; there are superb amenities in the form of shops, schools and Sheffield Supertram networks. Ideally placed for links to both the M1 motorway networks and Sheffield City Centre. Rother Valley Country Park nearby offers excellent leisure pursuits and Crystal Peaks Shopping Centre and Drakehouse Retail Park further superb facilities.